Do you know about my free Tutorials? 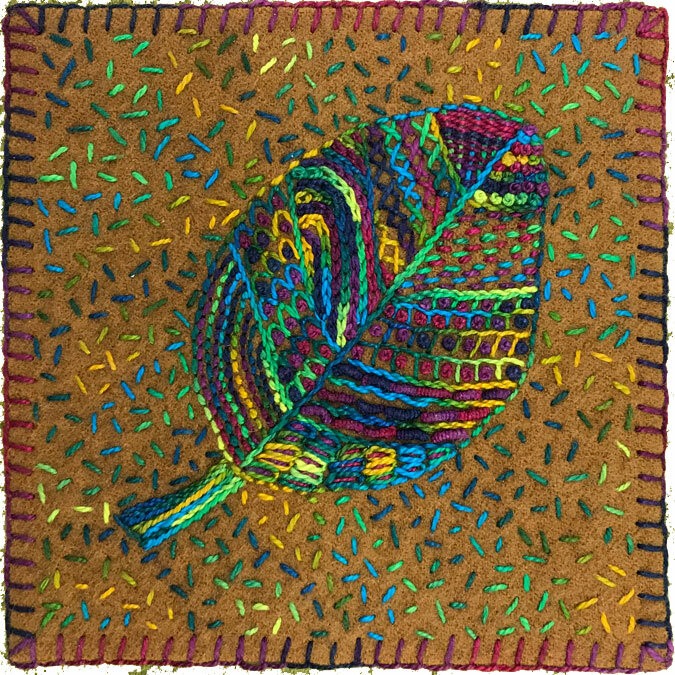 I’m so happy that Suzanne tried the Leaf Stitch Along tutorial to make this delightful piece of art work. Don’t you love the thread colors she chose? They really pop on the dark background. Thanks for sharing your work, Suzanne! The Leaf Stitch Along is just one of many you can try on wool, felt, or silk fabrics. This particular tutorial is a sort of sampler of stitches. Each partition in the leaf explores a different stitch combination. Change up the colors, fabrics, or stitches for your leaf. It’s all about enjoying the embroidery process and creating. Check out other free Tutorials here. This entry was posted in guest artist, tutorials by Laura. Bookmark the permalink.